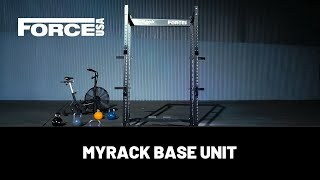 The Force USA MyRack Core Trainer is a great addition to your power rack. It is suited for all types of rotational torso training, including a range of upper body training. This is definitely a favourite of many people who train for functional strength. All you have to do is insert the end of a barbell into the sleeve which is attached to a pivot, and you are ready to rock and roll.